Cylindrical Roller Bearings are designed to carry heavy radial loads. These bearings are made with a single row, two rows, or multi-rows of rolling elements to meet an application's radial load requirement. Available in many standard series and configurations, they are widely used in multiple industries. The combination of high load capacity, moderate speed rating, and industry interchangeability make it one of the most popular bearing designs. These are produced in ISO series metric, ABMA series metric and inch, journal type, Full Complement series, multi-row series, and cluster mill sizes. These bearings are dimensionally interchangeable to same numbered and sized bearings in the industry. Components of journal bearings and other standard series are made interchangeable with other manufacturer's components. Many mounting arrangements can be achieved with the multiple configurations available with same load capacity for a given I.D., O.D. and width. Our cylindrical roller bearings can be manufactured in sizes from 3” bore diameter to 84” outside diameter. Internal radial clearances and cage designs can be engineered to your specific application when special applications are encountered. 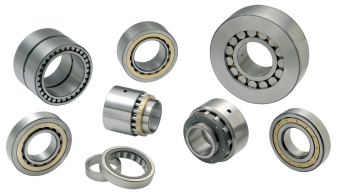 Single row Cylindrical Roller Bearings are designed to support heavy radial loads and are some of the most common bearings used around the world. Journal type cylindrical roller bearings are designed for moderate to heavy radial loads and carry the designation of a 3-piece separable bearing. Double Row or Two Row cylindrical roller bearings are designed for heavy loads that can’t be serviced with a single row bearing. Single Row Full Complement Cylindrical Roller bearings are designed for heavier loads than same dimensioned counterparts using a cage. Double Row or Two Row Full Complement Cylindrical Roller Bearings are designed for heavier radial load carrying capacity than a same sized cage series bearing. Multi-row or 4 row Cylindrical Roller Bearings are primarily designed and used as roll-neck bearings in rolling mills. Cluster mill or Backing Bearings are multi-row cylindrical roller bearings are used 20-high reductions mills rolling ferrous and non-ferrous materials.